The Ecocenter is a glocal hub in Tarifa for eco consciousness. We think global, we act local. 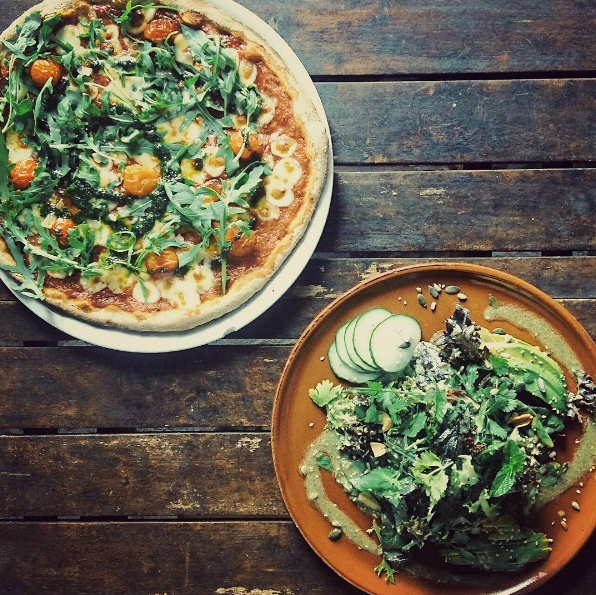 Our organic vegetarian restaurant and pizzeria are a social meeting place where you get to share meals with friends and family. In our Sala we offer yoga and dance classes, and we rent our space for special events and workshops. In our shop you can buy organic vegetarian products for at home. Does our space inspire you to organize something, do you wish to share something with us? We would love to hear from you, and we cannot wait to meet you in our center! "The fork is the most powerful tool to change the planet." Sharing food connects people of all ages and backgrounds. Each meal gives you the opportunity to make a conscious decision about how you impact your health, your environment and our common future. We are supporting you in making conscious decisions by offering you local organic products and vegetarian food. OUR PATIO IS THE PERFECT LOCATION TO SHARE A MEAL WITH YOUR FRIENDS AND FAMILY. We are open every day for breakfast, lunch and dinner. We offer a variety of yoga- and dance classes and kirtan. Looking to organize a workshop, training or event? Get in touch to find out about the possibilities. We have different massage therapists working from our center. Get in touch with them to make an appointment.